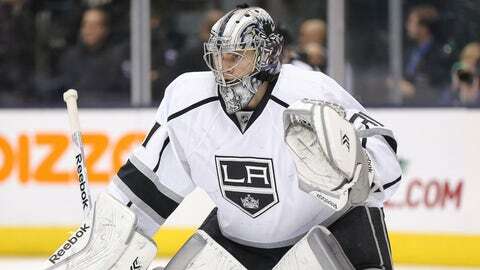 Los Angeles Kings rookie goalie Martin Jones won his first eight starts with an 0.98 goals-against average. The Anaheim Ducks have logged plenty of jet miles during the first half of the NHL season, playing 25 of their first 39 games on the road. They have suffered myriad injuries as well. And yet they keep rolling. They rallied from an early 2-0 deficit at Washington to beat the Capitals 3-2 and entered the Christmas break with a nine-game winning streak. "Fifty-nine points after 39 games is a pretty cool feat for what we’ve gone through," Ducks coach Bruce Boudreau told reporters after the game. "The players deserve all the credit." It is too soon to call this a Duck dynasty, but Anaheim is emerging as a strong Stanley Cup contender. Ryan Getzlaf, Corey Perry and Co. remain atop our NHL power rankings for another week. Here is how this week’s pecking order shakes out. For more puck coverage, check out The Iceman Cometh. GOOD NEWS: Veteran goaltender Jonas Hiller has won his last five starts. He allowed two or fewer goals in each. BAD NEWS: Their special teams still need work. The Ducks rank 25th in power-play efficiently and 21st in penalty killing. BOTTOM LINE: The franchise invested a fortune in Ryan Getzlaf and Corey Perry and both are playing at All-NHL levels. Hence the team’s success. GOOD NEWS: Patrick Kane played like a Hart Trophy candidate the past few weeks, scoring seven goals and adding 14 assists during a 12-game point streak. BAD NEWS: Top goaltender Corey Crawford remained sidelined through the Christmas break. BOTTOM LINE: They don’t have to play air-tight defense to win. They lead the NHL in goals scored by 17 over the next best offense. GOOD NEWS: Rookie goaltender Martin Jones won his first eight starts while posting a goals-against average of 0.98 and save percentage of .966. BAD NEWS: That streak ended with an emphatic 5-2 loss to the visiting Dallas Stars. BOTTOM LINE: With veteran Jonathan Quick back on the ice rebuilding his groin muscle flexibility in strength, the Kings more than survived a potential goaltending crisis. GOOD NEWS: James Neal got right back into the offensive flow after serving a five-game suspension. BAD NEWS: A lower body injury knocked center Evgeni Malkin out of the lineup until after the Christmas break. He was missed during a stunning 5-0 loss to the Senators. BOTTOM LINE: Despite suffering myriad injuries, the Penguins won 12 of 13 games to take charge of the Eastern Conference. GOOD NEWS: Top prospect Dmitrij Jaskin was prepared for his NHL promotion. He starred in the AHL before injuries depleted the Blues’ forward lines. BAD NEWS: Top gun Alexander Steen went on the injured list through the Christmas break. BOTTOM LINE: The Blues have been relying heavily on one line to drive the offense. A six-goal week by second-line power forward Chris Stewart was most welcome. GOOD NEWS: Their 13-1-3 home record is the second-best in the NHL, behind only Anaheim. BAD NEWS: High-scoring rookie Tomas Hertl will miss extended time with a serious knee injury. BOTTOM LINE: A 2-5-1 downturn dropped them to fifth place in the Western Conference, but they won their last two games heading into the break. GOOD NEWS: Carl Soderberg has assumed a bigger role with the injury-depleted attack, scoring six points in his past eight games. BAD NEWS: To nobody’s surprise, commissioner Gary Bettman upheld Shawn Thornton’s 15-game suspension. BOTTOM LINE: They rolled into the break with seven victories in their last nine games. GOOD NEWS: Matt Duchene heated up again, building a nine-point week with two goals and seven assists. Gabriel Landeskog scored his first goal in 11 games. BAD NEWS: The team’s lack of depth on the blue line began to show. That explains all the speculation about a trade for Panthers defenseman Dmitry Kulikov. BOTTOM LINE: With criminal charges against goaltender Semyon Varlamov dropped, he and the Avalanche will move forward without further distraction. GOOD NEWS: Coach John Tortorella is a hard man to please, but earning the NHL’s top penalty-killing ranking is a good place to start. BAD NEWS: Goaltender Roberto Luongo exited Vancouver’s last game before the break with an injury. BOTTOM LINE: The Canucks are thrilled to have Eddie Lack (6-2-0 with a 1.93 goals-against average and a .928 save percentage) ready to fill in as needed. GOOD NEWS: They hit the Christmas break with the league’s sixth-best power play and the fourth-ranked penalty-killing unit. BAD NEWS: Their even-strength offense ranks in the bottom half of the NHL. BOTTOM LINE: GM Marc Bergevin will continue his shopping once the holiday shopping freeze is lifted. His team still needs more scoring. GOOD NEWS: Valtteri Filippula did his best Steven Stamkos imitation by scoring two goals and adding two assists during a four-game surge. BAD NEWS: With Stamkos out, the Tampa Bay power play ranks just 20th in the NHL. BOTTOM LINE: They ran their winning streak to five games with a 6-1 victory over the Panthers Monday. GOOD NEWS: They have been resilient and explosive this season, coming back from two goals behind to get points in seven games. BAD NEWS: Since starting out 13-4-2 this season, the Coyotes have gone 6-6-5. BOTTOM LINE: They still need better goaltending from Mike Smith, who gave Buffalo its winning goal Monday by falling back into the net with the puck stuck in his pants. GOOD NEWS: Mikael Granlund scored in his first game back after missing 11 straight games and 13 of the past 14 with a concussion. BAD NEWS: They scored just nine goals while losing eight times in a nine-game span of road games. BOTTOM LINE: With goaltender Josh Harding sidelined while dealing with his multiple sclerosis treatment, Minnesota aren’t going to win as many 1-0 and 2-1 games. GOOD NEWS: Goaltender Kari Lehtonen leads the NHL with 12 road victories. BAD NEWS: Just when Sergei Gonchar started playing well for Dallas, a stray puck caught him in the jaw and knocked him out of the lineup. BOTTOM LINE: The Stars could make their move with a five-game homestand coming out of the break. GOOD NEWS: Versatile forward Brooks Laich returned after missing 11 games with a groin muscle injury. BAD NEWS: They blew three two-goal leads during two rough defensive outings. BOTTOM LINE: Goaltender Braden Holtby has taken a big step back this season, forcing Philipp Grubauer to fill in. That is not what coach Adam Oates envisioned for the season’s first half. GOOD NEWS: Back-up goaltender Cam Talbot won back-to-back starts, improving to 8-2-0 in his first NHL season. BAD NEWS: The Rangers went 1-4-2 during their recent homestand when Henrik Lundqvist started in goal. Overall they won just 10 of Lundqvist’s first 27 starts. BOTTOM LINE: Not to flog the non-breathing equine animal, but Lundqvist needs to pull his act together. GOOD NEWS: Jakub Voracek extended his point streak to eight games, a career high. He scored six goals and added seven assists in that span. Claude Giroux’s seven-game point streak (five goals, eight assists) is also a career best. BAD NEWS: Defenseman Andrej Meszaros played his way out of the lineup, sitting out five consecutive games as a healthy scratch. BOTTOM LINE: During a nine-game winning streak in home games, they outscored opponents 36-16. But a six-game road trip awaits them after the break. GOOD NEWS: Young winger Gustav Nyquist returned after missing three games with a groin muscle injury. BAD NEWS: Center Stephen Weiss will be sidelined until after the Olympic break after undergoing surgical repairs for a sports hernia. Defenseman Jonathan Ericsson joined the injury parade Monday, suffering an upper body injury. BOTTOM LINE: Exasperated Detroit fans booed their team off the ice after the Red Wings fell to 6-10-6 at Joe Louis Arena. Can you blame them? GOOD NEWS: Goaltender Jonathan Bernier delivered two exceptional performances – one in relief, one as a starter – to help the Leafs steal points. BAD NEWS: They won just once in a span of 11 road games. Overall, they fell into a 2-5-2 rut before the break. BOTTOM LINE: This has been a sub-.500 team since early November. Injuries are a factor, but not an excuse. GOOD NEWS: Jaromir Jagr turned back the clock and scored two goals and added nine assists during a seven-game streak. BAD NEWS: Winger Damien Brunner suffered a lower-body injury after finally playing his way out of the Devils doghouse. BOTTOM LINE: A modest 3-0-1 streak died abruptly with a 5-2 loss at Chicago, but the Devils remained just a point out of third place in the Metropolitan Division. GOOD NEWS: Mark Scheifele (three goals, five assists during a six-game surge) picked up his offense and Evander Kane (three goals, two assists in four games) came back from a lower-leg injury. BAD NEWS: They lost their last two games heading into the break. They are just 3-6-1 in their last 10 games. BOTTOM LINE: They aren’t going to make the playoffs this season, so the Jets must focus on making some long-range progress. Roster, coaching and management changes all appear necessary. GOOD NEWS: Torrid forward Jeff Skinner scored 10 goals in his last 11 games. BAD NEWS: The Canes want into the break with six losses (three in regulation play) in their last seven games. BOTTOM LINE: Goaltender Justin Peters suffered his first tough outing of the month, so former workhorse Cam Ward must finally take charge in goal. GOOD NEWS: After losing three consecutive home games, they blasted the Penguins 5-0 to get an early start on their holiday celebration. BAD NEWS: That was their first shutout victory since their first game of the season. BOTTOM LINE: Otttawa has allowed the second-most goals in the league. It is not hard to identify their top priority for the season’s second half. GOOD NEWS: They have scored power-play goals in their last six games, totaling eight in all. BAD NEWS: Goaltender Pekka Rinne suffered a setback in his comeback from his post-surgical hip infection. BOTTOM LINE: They staggered into the break with a four-game losing streak that dropped them below .500. GOOD NEWS: They snapped a three-game losing streak by toppling the Blues in a shootout Monday night. BAD NEWS: Lee Stempniak failed to score a goal in eight consecutive games. BOTTOM LINE: The Flames remain a hard-working bunch despite losing several key players to long-term injury. But they have no shot of getting into playoff contention. GOOD NEWS: Forwards Boone Jenner and Artem Anisimov scored points in three consecutive games. BAD NEWS: Marian Gaborik’s nightmare continues. After missing 17 games with a sprained left knee, he suffered a broken collarbone in his first game back. Jackets fans are clamoring to buy replica No. 10 sweaters with "Dumpty" on the back. BOTTOM LINE: They won their last two games heading into the break. They are 6-3-1 in their last 10. But they still sit below .500. GOOD NEWS: They went on the road and beat Montreal, Toronto and Ottawa to the chagrin of fans in the Great White North. BAD NEWS: Their reality check came at Tampa in the form of a 6-1 loss. BOTTOM LINE: Peter Horachek has the team playing respectably, but most of the veterans figure they are on borrowed time as GM Dale Tallon explores bail-out trades. GOOD NEWS: After an embarrassing 6-0 loss to the Blues ran their losing streak to six games, they responded with a 6-2 victory over the Jets. BAD NEWS: The Men of Oil won just five of their first 17 road games. BOTTOM LINE: Coach Dallas Eakins blasted an Edmonton fan for throwing a replica team jersey onto the ice to protest the team’s poor play. But with the Oilers sitting in the Western Conference basement, could anybody blame this person? GOOD NEWS: They are 4-0-1 in their past five home games. That is a big deal considering their 3-12-1 mark after 16 games at First Niagara Center. BAD NEWS: No team in the league was more contagious heading into the break. Linus Omark, Cody Hodgson, Ville Leino, Marcus Foligno and Alexander Sulzer all missed Monday’s game with illness, forcing Buffalo to start the game with just 16 skaters. BOTTOM LINE: Interim coach Ted Nolan is slowly but surely making this team respectable. He is bringing instant credibility to the Pat LaFontaine Regime. GOOD NEWS: They showed some rare life by winning 3-0 at Detroit, with veteran goaltender Evgeni Nabokov earning the shutout. BAD NEWS: That was just their third victory in 17 games. It is really, really hard to sustain such futility while playing in the Eastern Conference. BOTTOM LINE: Rather than build on last season’s breakout, the Islanders collapsed. There is no greater disappointment in the league.